Laundry services across the country process many tons of laundry daily. There are massive requirements throughout the armed services. Each of tens of thousands of hotels must launder linens, towels, and other articles. Large restaurants may have in house laundry facilities, while smaller ones contract to professional laundry services. Schools, and camps may need to provide laundry services for their students. Many industrial firms need to launder uniforms or protective clothing. And of course there are any number of professional laundry services that are available to consumers. It is important to know the weight of the laundered articles. Professional washing equipment is generally specified to be able to accept a certain weight of items. In order to be economically efficient, it is desirable to load the machines up to, but not exceeding their specified limit. Laundry services are also often charged by weight. Laundry is usually loaded into a laundry cart. Depending on the operation, this cart may be a small, wheeled bin, or a larger tote, or even a very large motorized conveyance. These laundry carts must be placed on a platform scale in order to ascertain the weight. Generally, the weight of the cart itself is known, and it will be subtracted from the measured weight to calculate the weight of the laundry items. These laundry scales should include a number of features. It is important that the scale platform have as low a profile as possible. Typically, a ramp will be used so that the laundry cart can be easily pushed onto the platform scale. The lower the height of the platform, the lower the angle of the ramp can be, facilitating this process. Furthermore, a low platform height will allow the ramp to be shorter, therefore minimizing floor space. Some of the popular laundry scales, such as those produced by Arlyn Scales, place the scale load cells directly into pockets built into the scale frame. This preserves the strength and integrity of the frame while providing a lower scale profile. It is also important that this industrial scale is fabricated from materials that will hold up well in a laundry environment. Of course there is significant water and moisture present. Detergents and other laundry chemicals can also cause corrosion of both the electronic scale and its load cells. Most of these types of scales are constructed from painted steel. The paint coating will provide some level of corrosion protection. But the carts themselves, and other items in the laundry facility, are certain to quickly scratch the paint surface. Corrosion will quickly attack the bare metal in the area of the scratch, and will in fact continue to corrode the neighboring areas, even underneath the paint surface. 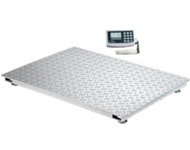 Arlyn Scales offers their platform scales in either aluminum or stainless steel. While stainless steel is most effective in resisting corrosion, it is also quite a bit more expensive. The finished scales are also heavier, making them less easy to move around within the facility. The aluminum digital scales may provide the best combination of low cost and corrosion resistance. Both the aluminum scales and the stainless steel scales manufactured by Arlyn Scales utilize stainless steel load cells exclusively. This is in contrast to most other platform scales of this type, which offer steel load cells with nickel plating. Although the plated load cells are less expensive, they will not provide as long service as the stainless steel. Eventually, they will experience pitting and other corrosion. The electronic elements on the load cell will not adhere as well to the surface. Additionally, steel load cells do not provide as much protection from shock loads. These types of shocks will be experienced by the platform scale if the laundry carts accidentally hit an already loaded scale from a side angle. Of course, this type of accident occurs quite often. The stainless steel load cells are able to withstand this type of abuse much better. In fact, the specific alloy of stainless steel used is then heat treated, to provide the optimal modulus of elasticity. The electronic components on the scale are also covered with a silicone material for further protection. The electronic scales must also include a digital indicator that is easy to read by an operator who may be some distance away. Large graphics displays offer this capability. It is also useful to provide communication channels from the laundry scale, so that the weight data can be recorded on a printer, or directed to a computer for data storage and later availability.